Hello beer fans! It is I, The Western Canadian Beer Lover here to discuss beer. Today I’d like to talk about two offerings from one of my favorite breweries, Quebec’s MicroBrasserie Charlevoix. The highly recognizable La Vache Folle line may be their more popular offering but they have been knocking it out of the park lately with a series called Dominus Vobiscum. The DV line includes a white, amber, Belgian double, Belgian triple, saison, lupulus(IPA) and Brut(sparkling ale). Dominus Vobiscum brews are billed as special Belgian style brews. The DV line comes in really interesting bottles with a simple wine-like appearance but they contain awesome beer. Just take a look! This heavy duty Belgian style IIPA is really amazing(think of yeasty champagne with hops). It is light on the tongue, light in colour but delivers a wicked hop and yeast punch. I cannot get over how thin this 10% ABV beer is. Typically bigger malts and residual plant matter make higher ABV possible and it is noticeable in denser body, heavier mouth-feel and darker appearance. 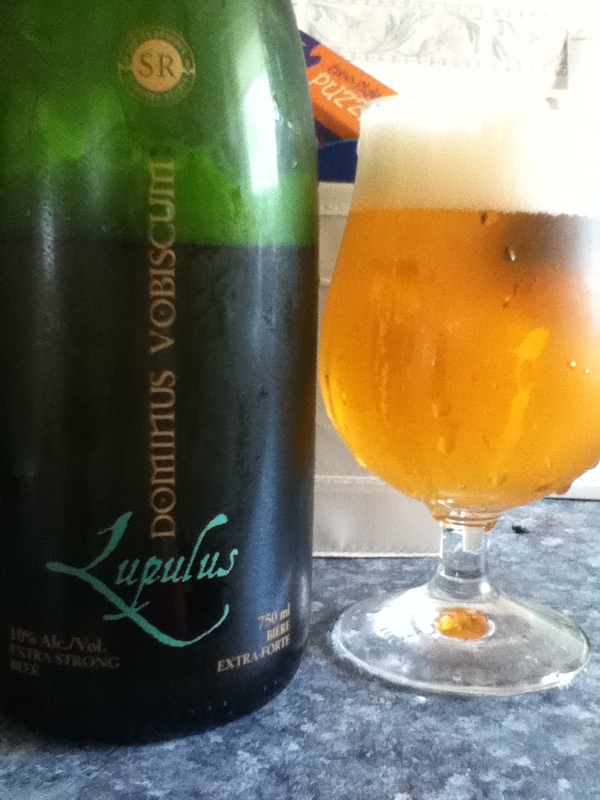 DV Lupulus is light in body, colour and mouth feel but still packs a punch with little to no noticeable alcohol(booze is part of the character but not overwhelming). The hop character is extremely unique for Lupulus as well. I’m not sure what Charelvoix had to do to balance hops into this beer but they did a wonderful job as a mild bitterness on the finish pairs so well with the rest of what this beer offers. I am really liking this series and can not wait to try more of them. 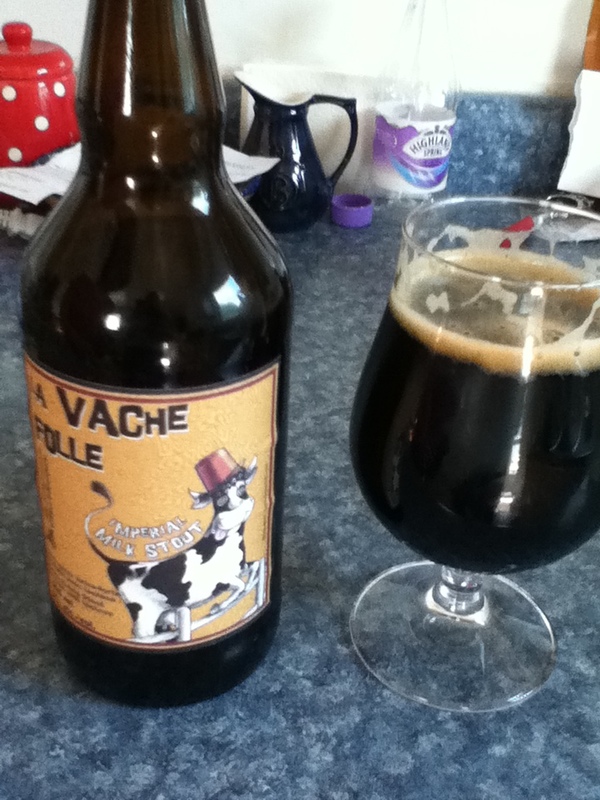 La Vache Folle is another really great run of beers. Probably one of the most recognizable beers in Canada with the oddly shaped shorter brown bottle with the crazy cow on the label, perhaps only out done by Flying Monkeys for ridiculous marketing. But with many things in life it’s what’s inside that counts and in the case of this particular bottle, imperial milk stout. There aren’t too many milk stout offerings produced in Canada but there doesn’t have to be as La Vache Folle is the best. Dark, malty, sweet, vanilla, coffee with an exceptional creamy body this imperial milk stout is simply world class. Hats off to MicroBrasserie Charlevoix. I have tried this beer six times now and it has never failed to deliver. Best consumed in the morning, and poured into a ceramic coffee mug, this beer delivers a latte-like mouth feel and flavour that even the most neurotic barista would be satisfied with. What can I say? If a slightly sweet but mostly just pure awesome stout is something you’re interested in make sure to taste this beer.